Toothbrushes today come in about as many sizes and shapes as one can imagine. There are angled heads, raised bristles, oscillating tufts and handles that change colors with use. While makers of toothbrushes make a lot of claims, there isn't any evidence that any one type of toothbrush design is better at removing plaque than another. The most important thing to remember when shopping for a toothbrush for your child is that he or she actually uses it. If they achieve unsatisfactory results from the toothbrush, it's more likely than not that they either aren't brushing long enough, or using the correct technique. Many children simply do not brush long enough. To effectively reach all areas and scrub off cavity-causing bacteria, your child should brush his teeth at least two to three minutes twice a day. Which toothbrush is best? 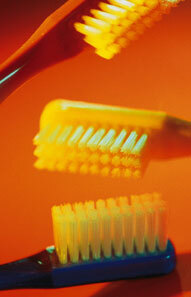 In general, a toothbrush head should be small (1" by 1/2") for easy access to all areas of the mouth, teeth and gums. It should have a long, wide handle for a firm grasp. It should have soft nylon bristles (natural bristles tend to harbor bacteria) with rounded ends so you won't hurt your gums. Medium and hard bristles are not recommended. Toothbrushes should be changed every three to four months. (If your child is sick, you should change the toothbrush at the beginning of an illness and after they feel better.) Be sure to change the toothbrush (or toothbrush head if it is an electric toothbrush) before the bristles become splayed and frayed. Not only are old toothbrushes ineffective, but they may harbor harmful bacteria that can cause infection such as gingivitis (bleeding gums) and periodontitis (inflammation or infection of the gums that goes untreated and spreads to the ligaments and bone that support the teeth.). Periodontitis is the primary cause of tooth loss in adults. This disorder is uncommon in childhood but increases during adolescence.